Well, another Friday has rolled around so time for another posting. Today, I thought I wood cover most of the woods I use in the construction of the whistle tubes. The choice of wood used in making the tube is mostly a matter of appearance. The effect on tone is slight (in a blind test most folks could not tell the difference from one wood to the next). One exception is use of Dymondwood. Dymondwood (a trade name) is a composite of very fine wood veneers and polymer adhesive cured under high pressure and high heat. This makes a very moisture resistant material, very important for whistles that are played for long periods of time, such as experienced in session playing. The wood veneers used can also be dyed different colors (red, black, green and etc.) which makes for a very striking effect. Cocobolo, a hard wood with very tight grain. It is highly figured and polishes to a high sheen. The color varies from dark brown to all most red. It is my all around favorite wood for whistle tubes. Honduran Rosewood, another hard wood lighter in color than Cocobolo. It is not as figured as Cocobolo and more consistent in color. 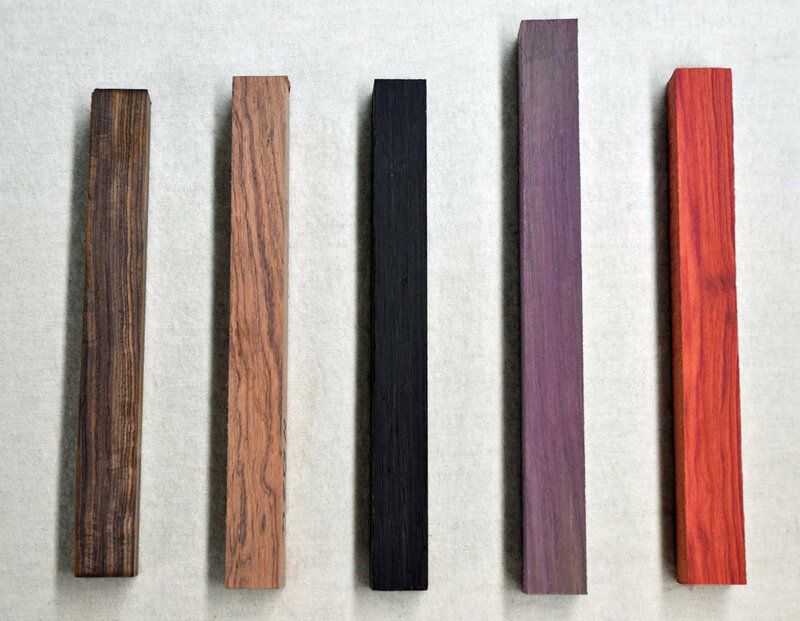 African Blackwood, a hard wood of varied shades of black. It can run from pure, dark black to black with shades of brown and/or yellow streaked throughout. It is a wood that is used also in the building of clarinets and other wood wind instruments. It also polishes out to high sheen. Purple Heart, as the name suggests, light purple in color. Not as hard as the before mentioned woods and does not polish out to a high sheen. It does make a very attractive whistle. Bloodwood, a light reddish colored wood. It is a softer wood but finishes nicely for a attractive whistle. Cocobolo Dymondwood, a composite using actual Cocobolo veneers. Red Dymondwood, a composite using light colored veneers (usually birch) dyed red. Black Dymondwood, a composite using veneers dyed a dark black. The overall effect is a gray shade. Green Dymondwood, a composite using veneers dyed green. I just recently ran across this configuration and have found a number of folks who like it (the whole Irish green thing I guess).